Turbo Twin/Tri Lobe rotary positive displacement compressors in two models Twin lobe and Tri lobe type. They are engineered and manufactured by capable and experienced personnel in a modem plant with the latest Machines and also with latest tooling. Production is controlled by close inspection. tests and attention to the smallest detail. Reliable field service is maintained by factory trained personnel Twin lobe Compressors Range in capacity up to 50,000 M3/hr. You are invited to request information on sizes not covered in this Brochure. The Rotary Positive displacement compresses twin lobe model has two figures eight impellers rotating in opposite directions and tri lobe model has three impellers in each shaft rotating in opposite direction. 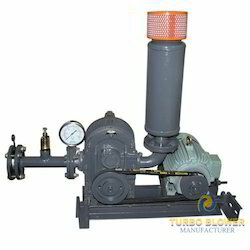 Turbo blower is one of the leading manufacturer and supplier of twin lobe roots blowers and blower systems. Turbo blowers have unmatched quality and performance. They have been specially designed to deliver 100% Oil free air varying discharge pressures for application such as Oil free conveying of gases and bulk materials. Sewage treatment, liquid homogenization and for combustion equipment. Our In-house casting production and technical expertise enables us to custom manufacture blowers to suit individual requirements of various applications. A complete range of twin lobe root blowers is available in capacity ranging from 10m3/hr. to 30,000m3/hr and pressure up to 0.6kg/cm2 in single stage or any capacity with parallel configuration. Compact design, heavy duty bearings enables continuous operation. Turbo blowers are also available as special units with all necessary accessories. Generously sized bearing to dynamic load. Alloy steel hardened and ground timing for better life. Rigid one piece graded cast iron casing for vibration free operation. Easy rotor timing setting through taper mount procedure. Improved, efficient rotor design and precision synchronization for lesser slip and higher volumetric efficiency. Alloy steel shaft ground to close tolerances for better fitment. Simple, easy and low cost maintenance. Better volumetric efficiency results in low operation cost. Industrial: Steam Compression. Oil free handling of industrial gases, Non Combustion Process Heating, Pulp and Paper Processing. Fluid Bed Combustion. Pneumatic Conveying: Pressure conveying of heat sensitive material, Fluidization and agitation of dense powders and liquids. Chemical / Gas processing: Handing corrosive gases, non sparking applications, distilleries of vapour gas. Environmental: Soil Vapour extraction. Air sparging, compost aeration. smoke stack filtration, dust collection, gas disposal, mobile vacuum waste water treatment, effluent water treatment, Sand filter backwash, Sludge conditioning, Digester gas processing. Looking for Twin Lobe Blower ?